At the beginning of our marriage, Kristi and I were both working full-time jobs and going to graduate schools in psychology. Obviously, we didn’t have a lot of free time to be together. 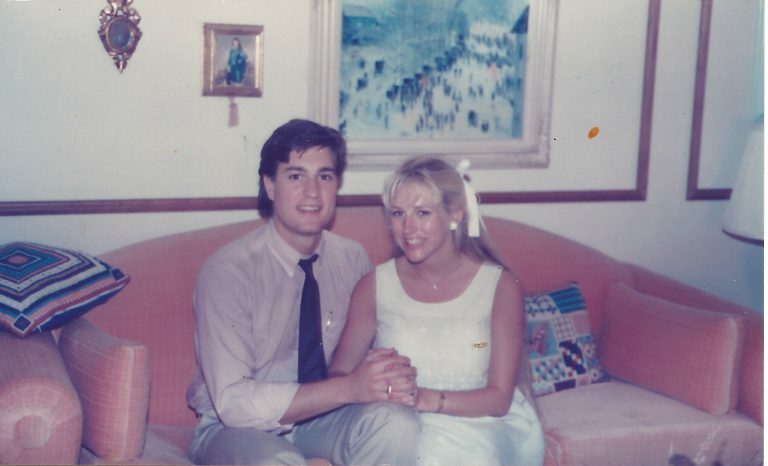 But we were very much in love as you can see in this picture taken in 1985! When we did have time together I wanted to go for a bike ride or relax and watch a movie, but Kristi had a different idea: she wanted us to talk and share our feelings. I was working as a psychotherapist intern so I was tired from spending lots of time listening to people’s emotions and resolving conflicts. To do that with Kristi felt like work to me. We had recently attended a marriage seminar by Gary Smalley and he said that a wife was like a “built-in marriage manual.” He insisted that the key to a good marriage was the husband learning to listen to his wife. I probably wouldn’t have gone if I’d known he’d say that. Now I had to agree to Kristi’s ideas! We started scheduling a weekly couch time, not sitting on the couch side-by-side to watch a movie, but sitting and looking into each other’s eyes and talking about how we were feeling in our lives and in our marriage. Unfortunately, what ended up happening was that Kristi had emotions to share about lots of things, but I didn’t have much to say other than that I was tired from working and studying so much. Sometimes she talked about ways I’d disappointed or hurt her and that gave me something to talk about. I was angry because I felt criticized and pressured like I couldn’t do enough to keep her happy. Of course, this just made her cry more. So we had this negative cycle going. I was busy and emotionally detached. Kristi told me she felt rejected. I got frustrated and defensive and just wanted to go back to my studies. She felt even more rejected. I got even busier. This was the happy result of making my wife my built-in marriage manual! But Kristi had another idea. She bought little journal notebooks for each of us to write out our feelings in the form of letters to each other. Then for our couch time, we’d each take turns reading our letters. This actually worked! We got out of the rut we’d slid into. Writing these personal letters to Kristi required me to share my emotions, not just in reaction to hers, but based on what I was experiencing and needing during the week. And it required Kristi to take ownership of her emotions, ask for what she needed, and limit her sharing to smaller segments of time. It helped us get into a back and forth flow of communication in which we each invited the other to step into our shoes and were less prone to react to each other. Essential to our improved emotional connection was me admitting that I had my own emotions and needs and then to take the risk to be vulnerable with Kristi and to trust that she had the strength to empathize with me. This, in turn, helped Kristi to feel safer with me, closer to me, and less likely to feel rejected when I was busy. So I learned that a wife really could be a built-in marriage manual and that the first chapter in the manual was the importance of couch time for sharing our emotions and listening to each other. We drew closer in our relationship with each other and with the Lord Jesus. There is much to be said about a couple who comes to the realization that our spouses are truly meant to be a blessing.